The beauty of being the mayor of a small town is that you can find a way to easily get around any laws that you don't like. 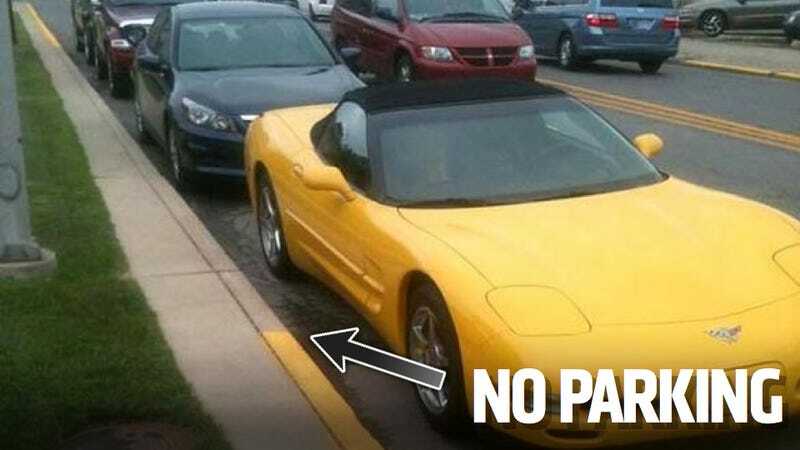 The mayor of Logansport, IN, Ted Franklin, parked his yellow Corvette Convertible halfway into a no parking zone last Friday outside of the town hall. Reportedly, police let him know the car was parked illegally around noon. But Franklin was probably attending to important city matters that were more important than moving the car. Hours later, someone else who got a ticket for parking a car in the same space called to complain that there was no ticket. Former Chief of Police AJ Rozzi issued a ticket at 4:15. Interestingly, Mayor Franklin had refused to hire Rozzi's son for a position on the police force. The mayor said that he didn't know there was an issue until after 4:20, when a friend told him about the ticket. Franklin paid the $20 fine on Monday, but he'll never get a ticket for it again. Why's that? Because Franklin now has his own extra large parking spot that's big enough to fit an entire bus full of mayors. It was placed in an area of the building's lot that was previously just for police use and it matches the color of his Corvette. Perhaps he wanted the car to be camouflaged? He did say that the spot will let him "get in and out of the city building much quicker" and presumably attend to pressing Logansport matters. He did not say that this was his way of sticking it to former Police Chief Rozzi for giving him the ticket in the first place.